A featherweight bout between Josh Emmett and Michael Johnson took place during tonight’s UFC Philadelphia main card on ESPN. 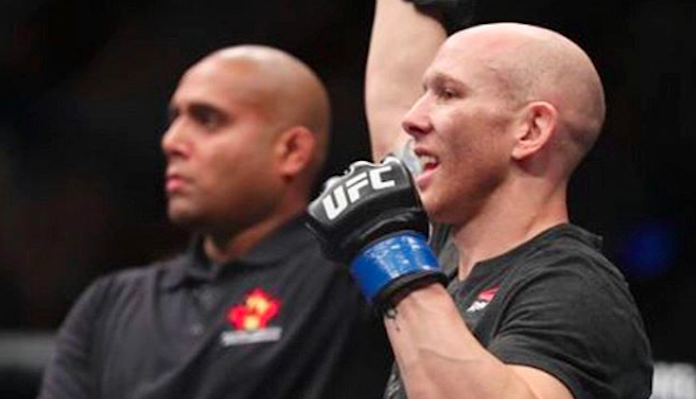 Josh Emmett (13-2 MMA) enters tonight’s fight looking to rebound, this after suffering a knockout loss to Jeremey Stephens in his most recent appearance in February of 2018. Prior to the setback, Emmett was coming off a knockout victory over Ricardo Lamas at UFC Winnipeg. Meanwhile, Michael Johnson enters UFC Philadelphia on a two-fight win streak, his latest being a unanimous decision win over Artem Lobov this past October. Round one begins and Johnson comes out quickly with a kick to the body. He follows that up with a jab. Emmett charges in with a leaping left that misses. Johnson circles to his right and throws a low kick. Emmett leaps in with a left hand. Johnson takes the center of the cage. Emmett shoots in for a takedown but it is not there. Johnson with a left jab. Emmett just misses with a counter right. Three minutes remain in round one. Emmett leaps in with a big right but Johnson counters nicely with a hook. Both men are attempting to time each other with counter punches. Josh lands a hard low kick. Johnson continues to press and lands a jab to the body of Emmett. The fighters trade kicks. Josh Emmett shoots in for a takedown but Michael Johnson says no. “The Menace” lands a hard kick to the body. Both men begin swinging wildly. Nothing lands clean and the horn sounds to end round one. Round two begins and Johnson starts off with a lot of early pressure. He has Emmett circling along the fence. Johnson with a right hand and then a nice hook to the body. He snaps his jab in the face of Emmett. Johnson with a hard low kick now. Emmett is struggling to find his way inside. Johnson continues to chip away. He lands a low kick. Emmett comes forward with a left and then a right. Both miss. Johnson replies with a jab and then a low kick. He is definitely landing the more quality shots now. Josh Emmett circles along the cage. He comes back to the center of the octagon only to eat a combination from Johnson. Emmett responds with a right hand now. He follows that up with a kick to the body. Both men connect with body shots. Johnson lands a hard kick. Thirty seconds remain and Emmett lands a kick low. The referee steps in and calls a pause to the action. Johnson says he is ok and we restart. Johnson with a nice left hand up the middle. Emmett leaps in with a right. He shoots for a takedown but Johnson defends and the horn sounds to end round two. Round three begins and Michael Johnson has to avoid a big right hand from Emmett early. He circles out and takes the center of the cage. Emmett charges at him with a combination but Michael avoids and lands a nice counter hook. It looks like Emmett senses the urgency here. Johnson comes at him with a jab. Emmett circles out. Johnson follows him and lands a nice hook. “The Menace” is using some good footwork here to stay out of the range of Emmett’s power punches. Johnson with a good hook to the body. Emmett replies with a body shot of his own. Josh leaps in with some power shots but once again Johnson avoids being touched. Just over two minutes remain now. Emmett misses with a right hook. Johnson fires back with a combination that falls short. Josh with a straight right hand up the middle. Michael replies with a good hook. Both men are swinging heavy leather now. One minute remains. Emmett with a low kick. Johnson lands a jab. Emmett with a right hand that floors Johnson and this one is all over! WOW! Sijara Eubanks threatens ‘coward’ Dana White: Pull me from UFC 230 and you’ll regret it!